Shake off those dust bunnies because Shameless Product Placements are back! 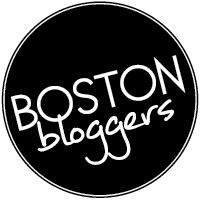 Readers take note – I receive no monetary compensation for the products in any of my posts. Now let’s get started! I tried Trader Joe’s Red Curry Sauce by accident because an emergency. You see, yours truly doesn’t always develop five-star recipes. It’s rare, but occurs about once or twice a year. A few weeks ago, I decided to try to make my own chicken curry in the slow cooker. After 8 hours of simmering, I absolutely hated it. The minute I walked into my apartment from work, I knew I’d made a misstep. The smell wasn’t right. It wasn’t appalling, but definitely not what I wanted nor expected after dumping five ingredients into my slow cooker at 6am. In order the rectify the situation, I hustled up to Trader Joe’s to look for a supplemental Thai/curry sauce to doctor up the devil dish. I picked up two sauces, used one and was left with a bottle of Trader Joe’s Red Curry Sauce in my pantry for the past month or two. Cut to a few weeks ago, when an impromptu dinner party sneaks onto my schedule midweek. 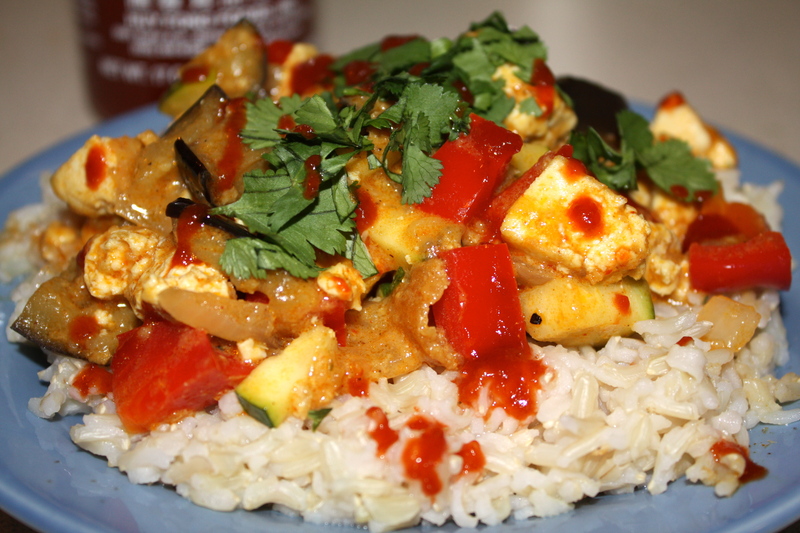 On my train ride home from work that night, I contemplated ingredients I had on hand – basmati rice, zucchini, sesame oil, tofu and…oh yeah, TJ’s Red Curry Sauce. I picked up a few extra items from the food store and got to cooking. Now then, I did have a moment where I contemplated making my own curry sauce. You see, I don’t exactly love this sauce from a nutrition perspective. For starters its high in sodium, like so many bottled sauces before it. Its saturated fat content is also a little disappointing. One serving of TJ’s curry sauce contains 3.5g saturated fat (5 servings per bottle). So I pondered what I would use to make my own sauce, light coconut milk being at the top of the list. But then I remembered, ANYTHING containing coconut milk will be high in saturated fat even if one uses the ‘Light’ version. One serving of light coconut milk (1/3 cup) carries 3 grams of saturated fat (5 servings per can). So I’ll do the math for you. One bottle of Trader Joe’s Red Curry Sauce has 2.5 more grams of saturated fat than one can of light coconut milk. I’m not saying it’s not a big deal, but in a pinch, I am willing to accept it. Shameless Product Placements on The Healthy Revival can do a few things. I do these post to (1) help foster healthy snacking, (2) provide you with alternative products for substitutes when trying to cook healthier recipes, and/or (3) simply making home cooking a little bit easier. I believe, as a whole, our society has lost touch with cooking at home. So many people are under the impression that in order to put dinner on the table it has to be complicated and time-consuming. It’s one of my many quests in life to make people aware of this misapprehension. If that means you need to buy a pre made sauce (be it marinara, a good marinade, salad dressing, etc), then so be it. We can start there. 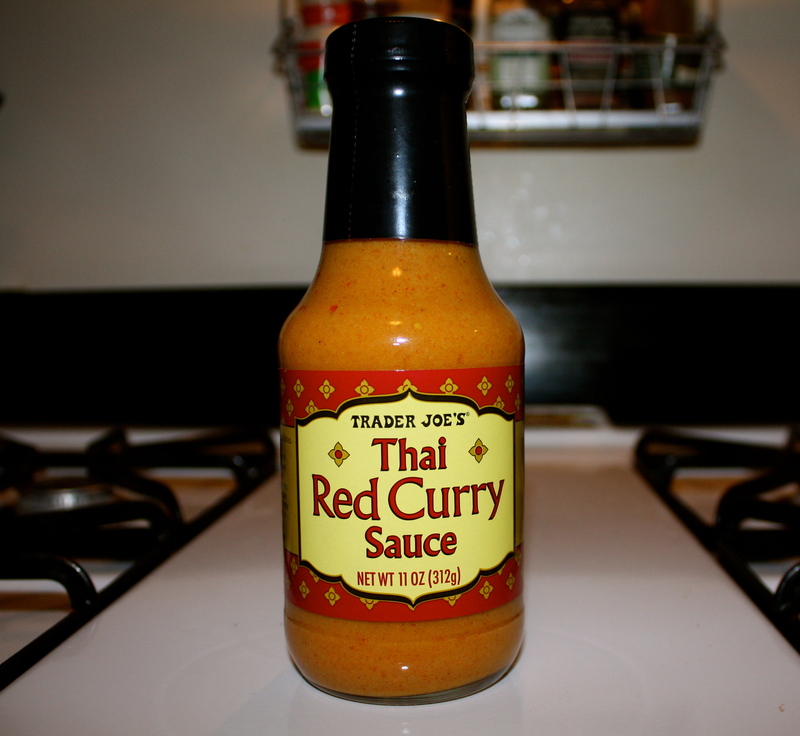 Per serving, one bottle of TJ’s Red Curry Sauce has 80 calories, 6g fat, and 3.5g saturated fat. As mentioned above, it is high in sodium so keep that in mind – ergo: do not add salt. You don’t need to. Feel free to adjust the vegetables in this curry, there’s honestly no rules on this one! I used basmati rice, but as a dietitian, I recommend using brown rice. Do as I say, not as I do. Prepare basmati rice according to directions. To press tofu, line a large dinner plate with one layer of paper towel. 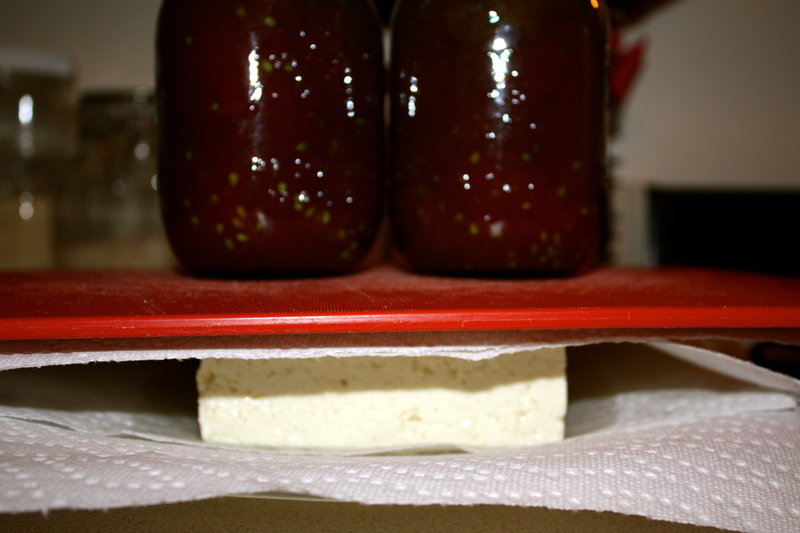 Place tofu on plate, top with another layer of paper towel cover with a cutting board and weigh down with canned goods, a brick, etc. See below for image. Let press for about 30 minutes, replacing paper towels halfway through. 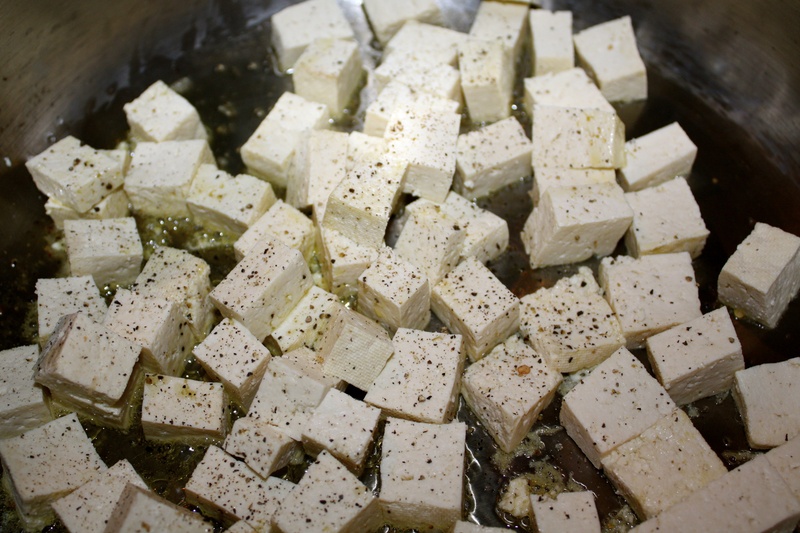 Once tofu has been pressed, cut into 1/2 inch cubes. Preheat oven to 375. 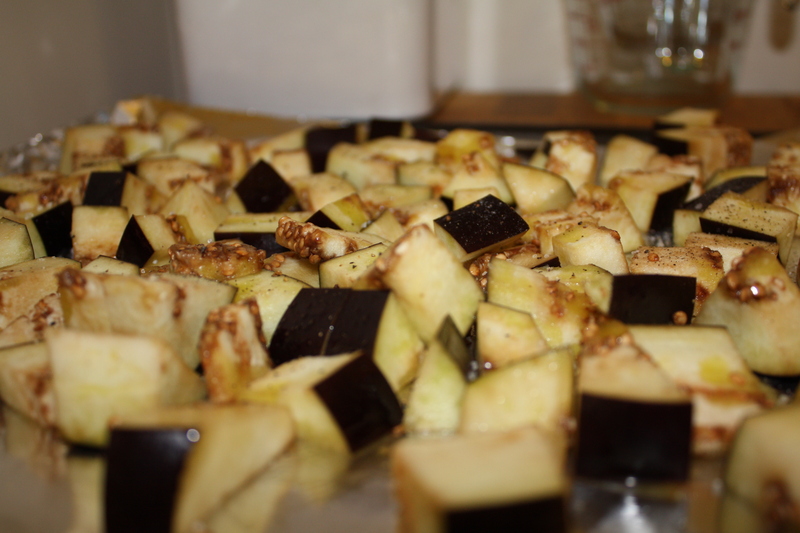 Toss cubed eggplant in olive oil, season with pepper and place on an aluminum lined baking sheet. Bake for about 15 minutes until browned and tender. Set aside. 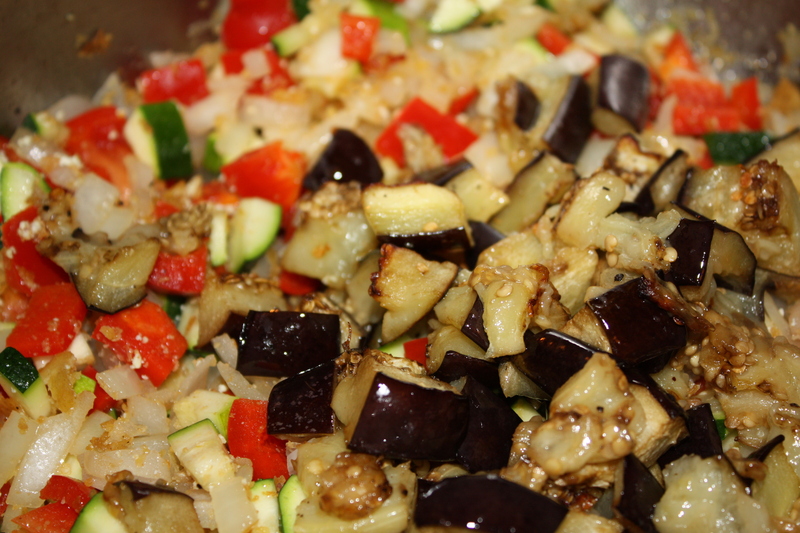 Heat a large pan over medium-high heat with sesame oil and 2 tsp of olive oil. Add tofu, season with pepper and sauté until lightly browned, about 10 minutes. Remove from pan and set aside. Add 1 tsp of olive oil back to pan. Once reheated, add onions, zucchini and red pepper. Saute for about 5 minutes. Stir in roasted eggplant and tofu, reheat. Add the whole 11-ounce bottle of Trader Joes Red Curry Thai Sauce, once emptied, fill bottle with ¼ cup of water, replace cap and shake. Add contents of bottle back to pan. Stir, cover and simmer for about 10 minutes. Plate rice and top with curry mixture. Garnish with cilantro and hot sauce if preferred. Serve and enjoy!